Business owners: where is your hungry crowd? The crowd of people who are beating a track to your business to get what it is you are selling them. These answers mean the business is working in a market a mile wide and an inch deep. They are often struggling to please everyone and struggling to get good quality leads with their marketing. The most effective way to operate a business is in a niche an inch wide and a mile deep. For example, instead of ‘targeting’ ALL small and medium businesses, pick a ‘niche’ that you have some affinity with or some knowledge of – like wholesale businesses with a turnover in excess of $2 million specialising in cleaning products. This is a market an inch wide (very specific) but a mile deep (there are a lot of them). DO YOUR MARKET RESEARCH! The reason you work an inch wide mile deep is because you really target your marketing at that niche. You know their wants, needs and desires. You know what pain or problem you can solve for them or what opportunities you can offer them that will help them grow their business. Give your clients what they want and they will give you what you want. Once you have decided on your inch wide (niche) market and the message they want to hear, then work out the best medium (No! We don’t mean clairvoyant) to get your message to them. Where do your niche market hang out? Do you market to them via print media, social media, online marketing, tv, radio, industry associations etc. 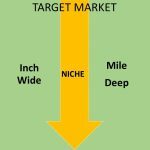 Operate in the right niche an inch wide and a mile deep and target your marketing. Your marketing will be more effective, your sales and business will grow, you will become “known” and respected in that niche and you will get referrals in that niche. Once that niche is cranking away you can develop another one. Scroll down and leave a comment below, share your experiences and join the conversation!